When Rod moved from the city, he began going to Erickson for his groceries, rented a post office box and told Evelyn, "this is a nice little town, people are friendly and this is where we will do our business." A year after moving from the city, Evelyn began working in Oshust's General Store, and later at Mountain Park Pharmacy. Rod worked at Elkhorn Ranch as a trail guide and also at Trailhead Outfitters. Today, Rod and Evelyn both work at the Heritage Co-op in Erickson. Rod plays guitar and sings in a country band. He is chairperson for the Little Valley Jamboree, a one-day music event held in Polonia, MB. The Jamboree began in 1998 and was organized to assist special needs children. 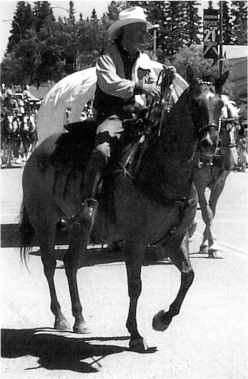 Rod was finally able to have horses of his own and was able to ride his favorite, RJ, in the parade he helped to organize for the Erickson 2000 Homecoming celebrations. Legion and Auxiliary and are on the Trans Canada Trail Committee. Rod and Evelyn appreciate living closer to Evelyn's family, who all live in the Minnedosa- Neepawa area. Since their return to the farm, they have hosted hooten­ annies and family reunions. The entire Lewandoski family enjoys coming to spend time on the home place where their father planted the spruce trees that still stand straight and tall today. They believe that life is for family and memones. I remained on the small holding south of Erickson for seven years after Ernest passed away. In 1985 and 1987, I took trips to Norway, Sweden, Denmark, Iceland, Holland, and Switzerland. I also went several places in Canada and the USA. I sold the land holding in 1987 to Cornell Vanderhusdt and moved into Erickson. I lived in three locations in Erickson, and when Peter Abel Place was built and ready for occupancy, I moved there. I was the first resident in Peter Abel Place and have lived here for seven years. It is a very nice place with six suites, which are a nice size. I like it very much. My family is all married with families of their own. I have several grandchildren and also three great-grand­ children. The youngest, Halie Lofgren is six years old. Editor S Note: Thora passed away October 19, 2000. Norman was employed with Co-op Implements until the closing of the factory in March 1985. From 1985 to 1990, he held the position of plant manager at the Winnipeg Division for John Buhler Inc. He then started his own business," Lofgren Enterprises", in management and design consulting. He worked on contract for various companies, and while on contract with Thor Manufacturing, he redesigned their custom vac machine for grain handling. In 1995, Thor offered him the position as plant manager and he remains in this position to present. Thor is a manu­ facturer of agricultural equipment in a custom machine shop in St. Boniface Industrial Park. Janet continues to work at Palliser Furniture. She worked the first 5 years in the head office and the past fifteen years in distribution. Her plans are to retire on her 20th anniversary in June 2000. Palliser Furniture is the largest Furniture manufacturer in Western Canada and has several factories in Winnipeg, Alberta, North Carolina, and Mexico.